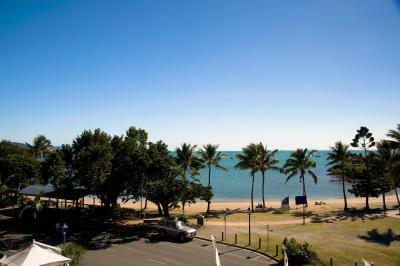 Lock in a great price for Airlie Beach Hotel – rated 8.7 by recent guests! Staff was always ready to help. We were upgraded to beach view automatically upon arrival. The staff are amazing. A pipe had burst on our floor and the staff dealt with the situation perfectly. We were moved to a new room straight away and were even refunded half of our stay, which was a pleasant surprise as it did not massively affect us. They could not have been more helpful and dealt with the situation with the highest standard of professionalism. Fantastic location, right next to the lagoon and shops. We loved it here and would recommend it to anyone. Close to shops and restaurants. Very clean bathrooms and bath. Nice view! Kind staff. The hotels location was good, the sea view rooms especially. It was quiet, clean and the receptionist was super friendly and helpful. The location was great. The staff were awesome as. And the parking was great too. Great location close to the lagoon and port of Airlie. Room was lovely, very clean and well equipped. Great secure parking onsite at no extra charge. Location is great as it's right on the Airlie esplanade and so close to the night life and restaurants that Airlie has to offer. Very spacious and well presented rooms. Airlie Beach Hotel This rating is a reflection of how the property compares to the industry standard when it comes to price, facilities and services available. It's based on a self-evaluation by the property. Use this rating to help choose your stay! One of our top picks in Airlie Beach.Featuring an outdoor swimming pool and free Wi-Fi, Airlie Beach Hotel offers fully air-conditioned accommodations in the heart of Airlie Beach town center. Each room at Hotel Airlie Beach includes an LCD TV, mini refrigerator, and private bathroom with shower, bath and hairdryer. The private balcony offers outdoor seating and views of the town or ocean. In-house restaurant Mangrove Jacks offers casual bistro-style meals, their specialty being wood-fired pizzas. 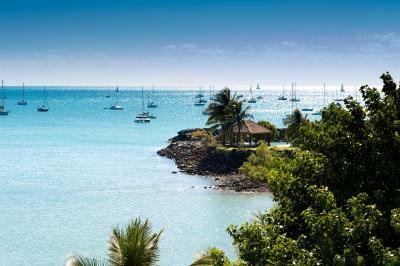 Airlie Beach Hotel is a 3-minute drive from Abel Point Marina, the departure point for snorkeling, diving, fishing and sailing trips. Airlie Beach Lagoon is situates 1,000 feet away. The tour desk can arrange day tours to Whitehaven Beach. Free secure undercover car parking is provided. When would you like to stay at Airlie Beach Hotel? Features an ocean-facing balcony with amazing views. Spacious room with a large balcony. House Rules Airlie Beach Hotel takes special requests – add in the next step! Airlie Beach Hotel accepts these cards and reserves the right to temporarily hold an amount prior to arrival. Please inform Airlie Beach Hotel of your expected arrival time in advance. You can use the Special Requests box when booking, or contact the property directly using the contact details in your confirmation. We booked a budget double in a 4*hotel and got a motel double rated 3*. It's the same price but it's not what we have booked. The room was okay but poorly soundproofed. Ventilation of the room is only possible by AC. The bathroom was not okay - not to say shabby. We stayed in Motels for half the price with much better, cleaner, modern bathrooms. The information on Booking.com says the hotel has a 24h reception. That's simply a lie. The reception was already closing when we arrived at 20:15. Its open from 07:00 to 20:00. Overall: very disappointing. We won't book in here again. Light in the bathroom was quite dull. Great pillows. Good sized room. Looking at the pictures on the website, we thought we would splurge on this hotel. Location across from the beach looked amazing. What the website didn’t mention is that the whole beach/park area is closed for construction and all fenced off. And forget about sleeping in as construction noise started at 6a in the morning. So, suggest that anyone thinking of staying here checks to see when construction work is completed. Nice rooms and close to restaurants. The room was pretty basic for the price we paid. Building works near the hotel although we had been advised. Staff not very helpful. There was an offer for 3rd night free but we were told we were unable to take advantage as we booked through booking.com. No hotel bar or restaurant due to building work being carried out. The car spaces on the parking level are a bit tight in some areas, other than that it was quite an enjoyable stay at the Airlie Beach Hotel. Construction work was going on throughout the hotel which we were not told about when booking . Hotel room was clean ,and pool was very small but warm. 4 people staying in room, 3 bath towels. Lucky we brought along our own beach towels!